In our faithfulness and trust and belief, we acknowledge that the Catholic Mass contains mysteries - the Holy Trinity and transubstantiation among them - which we embrace and celebrate. But what shouldn't be mysterious is the Mass itself. This hour-long celebration with our fellow Catholics shouldn't be a confusing choreography of sitting, standing, and kneeling with prayers recited by rote interspersed between priest and congregation. And with the help of a new book coming out of Australia, the Mass doesn't have to be mysterious. This is the Mass, published by The Catholic Weekly, Australia's Catholic newspaper, takes the reader, step by step, through the Sacred Liturgy. Featuring the Archbishop of Sydney, Cardinal George Pell, as the celebrant in St. Mary's Cathedral, the images give us reason to stop and ponder, while the text allows insight into what we're celebrating and why. 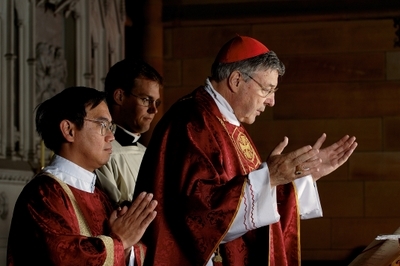 "Its learned and lucid text and the beauty of the photographs opens our hearts and minds to the wonder and glory of the Mass," writes Cardinal Pell in the foreward to the 160-page coffee table book. For more information on This is the Mass, visit www.catholicgiftshop.com.au.